According to Market Forecast, security holes currently allow an hacker to take a PC, physically connect it to the Ethernet network inside a car and use a software command to take control of the vehicle. Alternately, hackers could infect the system with a Trojan, which would let them take control of an engine remotely, while a person is driving the car. A true nightmare scenario. Wireless Systems: If you are purchasing a new car, acquaint yourself with the wireless systems to find out if any of the systems can be operated remotely. Auto Security And Information Service: If you are using an auto security and information service, like OnStar, make sure you don’t leave OnStar-related documents or your password in the car, because services like OnStar can remotely shut off your engine. If you report the vehicle stolen, there is the potential for mischief if your password falls in the wrong hands. Keep Track Over After-Market Devices: Generally speaking, after-market car systems are not rigorously tested or designed, exposing the buyer to undesirable vulnerabilities. Remote Shutdown Utility: Ask about remote shutdown related to repossession if you are financing through the company from which you purchased the vehicle. Ensure that the seller has security measures in place that control access to the system. Cyber Security is a huge concern these days, which is why MiG produced a uniquely detailed analysis and forecast of the cyber weapons universe – both offensive and defensive, governmental and private. 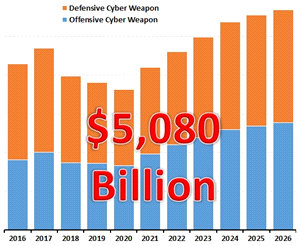 The study, titled: “Cyber Weapons (Offensive and Defensive) for Government and Private Sectors Global Market and Technologies Forecast, 2015-2026” includes a rare view into the black market side of this robust industry, and provides a surprising insight into the trends and forces driving this market and into the non-linear future it faces.